We did three more talks today. It was mainly journalists but also some local users groups and architects. The talk that explains how to decompose Tim O’Reilly’s Web 2.0 examples into design patterns using the Mackenzie-Nickull Architectural Patterns Meta Model template seems to be very popular. There are a lot of people anxious to read the book when it comes out. Back at the hotel, Prayank and I stopped for a drink at my hotel (the Leela Palace). I couldn’t decide what I wanted so I asked the bartender to invent a new drink. He came up with a really cool invention. When I asked him what it was, he said he just invented it and asked me my name. I told him and he proudly declared that the new drink is “The Duane”. The inventor, Mr. Ramalingham from the Library Bar at the Leela Palace, also started getting other customers ordering it who were sitting near me. 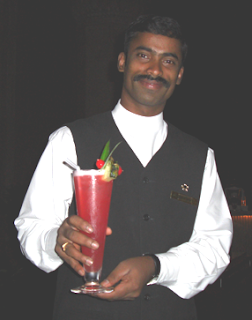 If you go to Bangalore and come to the Leela Palace, ask for "The Duane". IMO – this is the best cocktail in the world. Traffic continued to be bad in Bangalore. 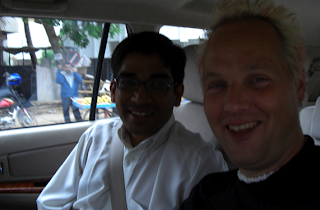 Prayank and I just had to laugh it off as we dodged cows, a guy riding a horse, pedestrians and about 45 different types of wheeled vehicles. Right now it is time to head to the airport to get back to Singapore, then on to Sydney. Further away from home. I arrived in India late at night to find what appeared to be complete chaos. 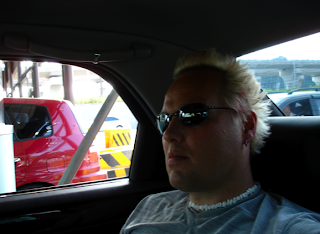 After getting my luggage, the private car picked me up in what I can only describe as a non-contact demolition derby. The entire parking lot was jammed packed with cars all beeping horns at each other. The funny thing is that it is like adding bold text to emphasize a phrase. If you bold everything, you have emphasized nothing. The Indians use their car horns in Bangalore very similarly. To beep at everything is to beep at nothing (but it is much noisier). Now just to clarify, I have been to New York, LA, Paris, Barcelona, London and Berlin. Traffic is bad in so many places but Bangalore takes the cake. The lines in the middle of the road and the traffic lights hanging above the streets are meaningless to those who use the roads. The poor lines lie in the road in an utterly futile attempt to mark lanes, impassioned in their quest and ignored universally. Nevertheless, what a blast!! We got a great driver. He got us everywhere ahead of schedule. At our visit to Fidelity, I received a great honor. I was asked to light a candle in front of a huge crowd with the other guest speakers to inaugurate their architects convention. There were at least 250 architects present. The talk went very well too and I found the crowd very easy to relate to as architects just get the topic of design patterns, models and reference architecture for Web 2.0. The questions were bang on. After Fidelity, we grabbed our driver and raced across town, dodging 3-wheeled taxis, cows, pedestrians and potholes that could have swallowed a hippo. The second talk at Infosys was really well received too. The architects at Infosys were totally amazed to see that Adobe has a really good enterprise story and we have baked SOA into our new LiveCycle ES architecture. I can’t wait to share this with the LiveCycle team back home. Infosys definitely is a first class company. Today, we meet with some press and bloggers in addition to a few side meetings. Should be fun. ..and Hello Bangkok/Bangalore India. Traveling all night is fun, really! NOT!! My suspicions are confirmed; Cathay Pacific is first class royale! Check out my seat/bed/cocoon. Today was another frantic day of early rise and nonstop presentations and meetings. From the start of the day it was end-to-end presentations with the exception of about 18 minutes where I had a chance to eat some food. Zip2Zap showed off a great demo of a really cool Web 2.0 application for financial services built with Flex. The Hong Kong IT crowd, like the crowds in Korea and Singapore, seems very eager to adopt the latest in Web 2.0 technologies. There is a great infectious air of enthusiasm and a “let’s do it” attitude. No wonder this region is booming economically. Lots of smart developers and lots of open minded IT managers who seem to understand that the core design patterns of SOA and Web 2.0 are essential to the future of their enterprises. This makes it very easy to deliver a compelling message about why LiveCycle ES is a must have for any company serious about being in sync and not losing its edge to the competition. I have been asked a lot about Microsoft Silverlight and JavaFX from Sun. While I have not used either of these technologies, I wouldn’t compare them directly to AIR (the technology formerly known as Prince… oops. I meant Apollo) . What is clear is that the future of RIA development is going in the same direction. The fact that Adobe, Sun and Microsoft have all started carving out a niche in this area seems to indicate it is the place to be. Of course, Adobe has the advantage being the incumbent player in the Enterprise 2.0 space (Clarification: to me, Enterprise 2.0 is the adoption of the design patterns of Web 2.0 by enterprises). Some analysts might cast it differently so ask for a definition when talking to someone. On a personal note, I really miss my family now. My son has a new mountain bike needing some assembly which I need to be doing but this trip pays the bills. My wife and two young daughters are hard to be without. Ahh – one more week till I return. No rest for the wicked. As I write this I am on a plane bound for Bangkok then on to Bangalore. My less-than-a-week-old 15” MacBook Pro has some serious display issues too. I went with the newer sharper display. It seems to be a hardware issue and it is making it hard to do presentations. The job of an evangelist requires nerves of steel. When things go terribly wrong with less than 3-5 minutes before starting a presentation, you need to have a backup plan, remain cool, and always do what needs to be done to do the job. Bangalore will be another day of panic but I am also looking forward to spending more than 18 hours in one country. I get in after midnight and have to be ready to leave the hotel by 8:00 AM. So tired…. Need sleep. 9:00 – 10:00am: Room set up. Computer check. 4:30 – leave for airport. It is now 5:15 and I am sitting in an airport lounge. On the way out of the city I saw this amazing statue. 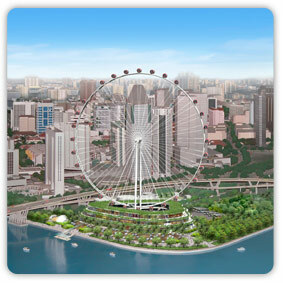 It is either going to be the world’s largest Ferris wheel or the world’s largest bicycle wheel truing stand. Either way – well done Singapore! This country is also very cool! Everyone is really energetic and positive. If only there was a way to export this energy to other areas of the world. Tonight I fly to Hong Kong. 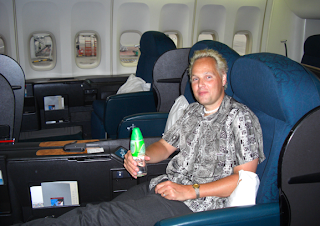 After two days of luxury aboard Singapore Airlines (my gawd – has it really only been two??? ), tonight I see what Cathay has to offer for first class. Seoul is such a beautiful city. 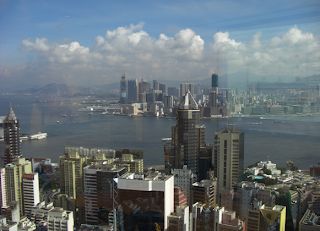 When I was here 8 years ago, the smog and traffic were so bad I could barely see three blocks. Today is a beautiful day, filled with sun and clean air. The day was very busy. All day long talk, listen, talk, listen. Here are some interesting things. My fellow blog brethren have informed me that the Korean Flex user group community has over 6500 members! They also asked me to come back and party with them with some cool Korean liquor called Shoju (spelling???). These guys were fun. I just about missed my plane thanks to a minor fender bender which slowed freeway traffic to a crawl. Managed to make it by about 3 minutes. Once again, Singapore Airlines exceeded every single other airline. Flying to Singapore, will be there soon. .. and now I am in Korea! Anyung ha se yo! Je erumun Duane yim ni da! Ju nun Canada esu whatsem ni da. I am now in Korea and I love everything about this country. In South Korea, about 70% of the land is covered with mountains and Seoul itself is a world class city with a world class tech community. I am a bit haggered but glad to be here again. Being an evangelist for Adobe Systems definitely has its benefits. At the airport I got picked up in an Equus Limo (made by Hyundai). The car is amazing - full on Luxury. At the Hotel Intercontinental, there is a pyramid sticking out of the ground reminiscent of the Louvre in Paris where I was 3 weeks ago. 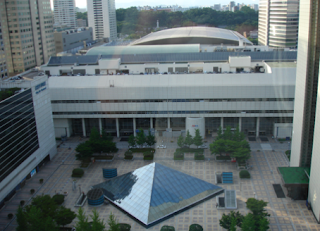 Tomorrow I will be meeting some of the top bloggers and top press in Korea. It will be an honor to meet with luminaries such as Ik-Jong Kim (Electronic Times), Hong-Seok Lee (Digital Times), Kyu-Hee Cho (eWeek Korea), Management & Computer magazine's Sang-il Lee, Computer World's Jeong-eun Kim, Jun-Kee Park or Monthly w.e.b., Electronic Information Times' very own Jeong-Hyun Heo, Computer Times' Jeong-Hyun Kim and several other top notch publications. This country just *loves* technology. I am really keen to meet my fellow blogosphere devotees too. A special meeting has been arranged where I will get a chance to talk to Jun-Gyun Bae (Flex Adobe Community Champion), Ho-Sung Shin (Flex Adobe Community Champion & one of the brains behind the Dongbu Life insurance Flex project), Man-Young Lee (Flex Adobe Community Champion, BAM, Java and BPM master), Kwang-Nam Hur (Flash Adobe Community Champion), Joo-il Yang (blogger extraordinaire and Flash Designer), Chang-Shin Lee (top flight Java guy), Tae-Wan Kim, Dong-Ho Lee, and Sung-Hoon Choi among others. Many people who talk to me think the evangelist role is only about talking, promoting etc. It is also about listening. Tomorrow, while I might be giving two presentations, most of the day will be focused on listening to what Koreans want from Adobe and what they think we need to be doing in the next 1,3,5 and 10 years. After all, they are the real users and the ones who are instrumental to our success. 9:00 - meet local Adobe staff. 23:00 - new blog entry and prepare for next day. This is the reality of Technical Evangelism. If you think you've got what it takes, email us - we have more jobs like this open!